Search for links and images in the Paleontology Portal. 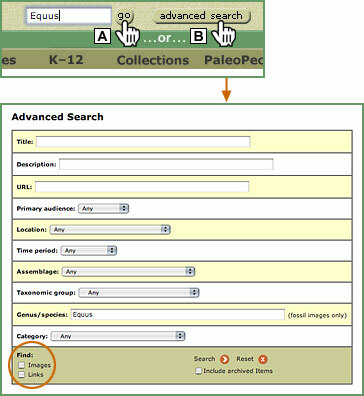 Type your query into the search box at the top of any page and then click on “go” to find both links and images anywhere in the Paleontology Portal. Click on the “advanced search” button, then use the search form to define the parameters of your search. Use the Find checkboxes at the bottom left of the search form to specify whether you are searching for only images, only links or both. Check “Include archived items” to include expired calendar items in your search.